Making a Lot of Money. The odds increase dramatically as your income increases. I.R.S. statistics for 2014 show that people with incomes of $200,000 or higher had an audit rate of 2.71%, or one out of every 37 returns. Report $1 million or more of income? There’s a one-in-13 chance your return will be audited. The more income shown on your return, the more likely it is that you’ll be hearing from the I.R.S. Failing to Report All Taxable Income. The I.R.S. gets copies of all 1099s and W-2s you receive, so make sure you report all required income on your return. I.R.S. computers are pretty good at matching the numbers on the forms with the income shown on your return. A mismatch sends up a red flag and causes the I.R.S. computers to spit out a bill. Taking Higher-than-Average Deductions. If deductions on your return are disproportionately large compared with your income, the I.R.S. may pull your return for review. But if you have the proper documentation for your deduction, don’t be afraid to claim it. There’s no reason to pay the I.R.S. more tax than you actually owe. Running a Small Business. Schedule C is a treasure trove of tax deductions for self-employeds. But it’s also a gold mine for I.R.S. agents, who know from experience that self-employeds sometimes claim excessive deductions and don’t report all of their income. I.R.S. looks at both higher-grossing sole proprietorships and smaller ones. Special scrutiny is also given to cash-intensive businesses (taxis, car washes, bars, hair salons, restaurants and the like) as well as to small business owners who report a substantial net loss on Schedule C. Other small businesses also face extra audit heat, as I.R.S. shifts its focus away from auditing regular corporations. The agency thinks it can get more bang for its audit buck by examining S corporations, partnerships and limited liability companies. So it’s spending more resources on training examiners about issues commonly encountered with these pass-through firms. Taking Large Charitable Deductions. If your charitable deductions are disproportionately large compared with your income, it raises a red flag. The I.R.S. knows what the average charitable donation is for folks at your income level. Also, if you don’t get an appraisal for donations of valuable property, or if you fail to file Form 8283 for noncash donations over $500, you become an even bigger audit target. And if you’ve donated a conservation or façade easement to a charity, chances are good that you’ll hear from the I.R.S. Be sure to keep all your supporting documents, including receipts for cash and property contributions made during the year. Claiming Rental Losses. Normally, passive loss rules prevent the deduction of rental real estate losses. With two important exceptions. If you actively participate in the renting of your property, you can deduct up to $25,000 of loss against your other income. This $25,000 allowance phases out as adjusted gross income exceeds $100,000 and disappears entirely once your AGI reaches $150,000. A second exception applies to real estate professionals who spend more than 50% of their working hours and over 750 hours each year materially participating in real estate as developers, brokers, landlords or the like. They can write off losses without limitation. The I.R.S. is actively scrutinizing rental real estate losses, especially those written off by taxpayers claiming to be real estate pros. It’s pulling returns of individuals who claim they are real estate professionals and whose W-2 forms or other non-real estate Schedule C businesses show lots of income. Agents are checking to see whether these filers worked the necessary hours, especially in cases of landlords whose day jobs are not in the real estate business. The I.R.S. started its real estate professional audit project several years ago, and this successful program continues to bear fruit. Taking an Alimony Deduction. Alimony paid by cash or check is deductible by the payer and taxable to the recipient, provided certain requirements are met. For instance, the payments must be made under a divorce or separate maintenance decree or written separation agreement. The instrument can’t say the payment isn’t alimony. And the payer’s liability for the payments must end when the former spouse dies. You’d be surprised how many divorce decrees run afoul of this rule. Alimony doesn’t include child support or noncash property settlements. The rules on deducting alimony are complicated, and the I.R.S. knows that some filers who claim this write-off don’t satisfy the requirements. It also wants to make sure that both the payer and the recipient properly reported alimony on their respective returns. A mismatch in reporting by ex-spouses will almost certainly trigger an audit. Writing off a Loss for a Hobby. You must report any income you earn from a hobby, and you can deduct expenses up to the level of that income. But the law bans writing off losses from a hobby. To be eligible to deduct a loss, you must be running the activity in a business-like manner and have a reasonable expectation of making a profit. If your activity generates profit three out of every five years (or two out of seven years for horse breeding), the law presumes that you’re in business to make a profit, unless the I.R.S. establishes otherwise. Be sure to keep supporting documents for all expenses. Deducting Business Meals, Travel and Entertainment. 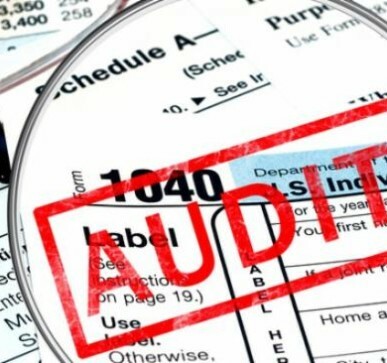 Big deductions for meals, travel and entertainment are always ripe for audit, whether taken on Schedule C by business owners or on Schedule A by employees. A large write-off will set off alarm bells, especially if the amount seems too high for the business or profession. Agents are on the lookout for personal meals or claims that don’t satisfy the strict substantiation rules. To qualify for meal or entertainment deductions, you must keep detailed records that document for each expense the amount, the place, the people attending, the business purpose and the nature of the discussion or meeting. Also, you must keep receipts for expenditures over $75 or for any expense for lodging while traveling away from home. Without proper documentation, your deduction is toast. Failing to Report a Foreign Bank Account. The I.R.S. is intensely interested in people with money stashed outside the U.S., especially in countries with the reputation of being tax havens, and U.S. authorities have had lots of success getting foreign banks to disclose account information. The I.R.S. also uses voluntary compliance programs to encourage folks with undisclosed foreign accounts to come clean — in exchange for reduced penalties. The I.R.S. has learned a lot from these amnesty programs and has been collecting a boatload of money (we’re talking billions of dollars). It’s scrutinizing information from amnesty seekers and is targeting the banks that they used to get names of even more U.S. owners of foreign accounts. Failure to report a foreign bank account can lead to severe penalties. Make sure that if you have any such accounts, you properly report them. This means electronically filing FinCEN Form 114 by June 30 (April 15 for filings beginning in 2017) to report foreign accounts that total, in the aggregate, more than $10,000 at any time during the previous year. And those with a lot more financial assets abroad may also have to attach I.R.S. Form 8938 to their timely filed tax returns. Claiming 100% Business Use of a Vehicle. When you depreciate a car, you have to list on Form 4562 what percentage of its use during the year was for business. Claiming 100% business use of an automobile is red meat for IRS agents. They know that it’s rare for someone to actually use a vehicle 100% of the time for business, especially if no other vehicle is available for personal use. The I.R.S. also targets heavy SUVs and large trucks used for business, especially those bought late in the year. That’s because these vehicles are eligible for favorable depreciation and expensing write-offs. Make sure you keep detailed mileage logs and precise calendar entries for the purpose of every road trip. Sloppy recordkeeping makes it easy for a revenue agent to disallow your deduction. As a reminder, if you use the I.R.S.’s standard mileage rate, you can’t also claim actual expenses for maintenance, insurance and the like. The I.R.S. has seen such shenanigans and is on the lookout for more. Taking an Early Payout from an IRA or 401(k) Account. The I.R.S. wants to be sure that owners of traditional I.R.A.s and participants in 401(k)s and other workplace retirement plans are properly reporting and paying tax on distributions. Special attention is being given to payouts before age 59½, which, unless an exception applies, are subject to a 10% penalty on top of the regular income tax. An I.R.S. sampling found that nearly 40% of individuals scrutinized made errors on their income tax returns with respect to retirement payouts, with most of the mistakes coming from taxpayers who didn’t qualify for an exception to the 10% additional tax on early distributions. So the I.R.S. will be looking at this issue closely. The I.R.S. has a chart listing withdrawals taken before the age of 59½ that escape the 10% penalty, such as payouts made to cover very large medical costs, total and permanent disability of the account owner, or a series of substantially equal payments that run for the longer of five years or until age 59½. Claiming Day-Trading Losses on Schedule C. Those who trade in securities have significant tax advantages compared with investors. The expenses of traders are fully deductible and are reported on Schedule C (investors report their expenses as a miscellaneous itemized deduction on Schedule A, subject to an offset of 2% of adjusted gross income), and traders’ profits are exempt from self-employment tax. Losses of traders who make a special section 475(f) election are fully deductible and are treated as ordinary losses that aren’t subject to the $3,000 cap on capital losses. And there are other tax benefits. But to qualify as a trader, you must buy and sell securities frequently and look to make money on short-term swings in prices. And the trading activities must be continuous. This is different from an investor, who profits mainly on long-term appreciation and dividends. Investors hold their securities for longer periods and sell much less often than traders. The I.R.S. knows that many filers who report trading losses or expenses on Schedule C are actually investors. So it’s pulling returns and checking to see that the taxpayer meets all of the rules to qualify as a bona fide trader. Gambling: Failing to Report Winnings or Claiming Big Losses. Whether you’re playing the slots or betting on the horses, one sure thing you can count on is that Uncle Sam wants his cut. Recreational gamblers must report winnings as other income on the front page of the 1040 form. Professional gamblers show their winnings on Schedule C. Failure to report gambling winnings can draw IRS attention, especially if the casino or other venue reported the amounts on Form W-2G. Claiming large gambling losses can also be risky. You can deduct these only to the extent that you report gambling winnings (and recreational gamblers must also itemize). But the costs of lodging, meals and other gambling-related expenses can only be written off by professional gamblers. The I.R.S. is looking at returns of filers who report large miscellaneous deductions on Schedule A, Line 28 from recreational gambling, but aren’t including the winnings in income. Also, taxpayers who report large losses from their gambling-related activity on Schedule C get extra scrutiny from I.R.S. examiners, who want to make sure that these folks really are gaming for a living. Claiming the Home Office Deduction. The I.R.S. is drawn to returns that claim home office write-offs because it has historically found success knocking down the deduction. Your audit risk increases if the deduction is taken on a return that reports a Schedule C loss and/or shows income from wages. If you qualify for this savings, you can deduct a percentage of your rent, real estate taxes, utilities, phone bills, insurance and other costs that are properly allocated to the home office. That’s a great deal. Alternatively, you have a simplified option for claiming this deduction: The write-off can be based on a standard rate of $5 per square foot of space used for business, with a maximum deduction of $1,500. To take advantage of this tax benefit, you must use the space exclusively and regularly as your principal place of business. That makes it difficult to successfully claim a guest bedroom or children’s playroom as a home office, even if you also use the space to do your work. “Exclusive use” means that a specific area of the home is used only for trade or business. Engaging in Currency Transactions. The I.R.S. gets many reports of cash transactions in excess of $10,000 involving banks, casinos, car dealers and other businesses, plus suspicious-activity reports from banks and disclosures of foreign accounts. So if you make large cash purchases or deposits, be prepared for I.R.S. scrutiny. Also, be aware that banks and other institutions file reports on suspicious activities that appear to avoid the currency transaction rules (such as persons depositing $9,500 in cash one day and an additional $9,500 in cash two days later).